Located on the beautiful Broadwater, Runaway Bay is home to a range of single-family homes, townhouses, duplexes, complexes and high and low-rise buildings. With this mix comes issues with antennas, whether through being shared across multiple properties or having more than one television in the home. The area is also home to some lovely properties, where homeowners want homes with clean lines and less “stuff”. This generally leads to homes having wall mounted televisions instead of sitting on cabinets. If you live in the suburb and you’re having issues with your television signal or are simply looking to professionally wall mount your television, Home Style Antennas provides a range of antenna services in Runaway Bay. Living near the Broadwater means salt air, and often salt air can mean a rusted or damaged antenna. Storms and high wind can also damage or move your antenna which means signal that was once working fine, may not longer work after a storm. If you’re having trouble with a signal that drops in and out, we can help. There are generally two or three main reasons a signal will drop in and out – interference, damaged antenna or damaged cables. When you call us for an interrupted signal, we’ll check your antenna and cables for any signs of damage or rust. In the Runaway Bay area, it is unlikely to have interference unless you are in a low-set house or unit surrounded by the few high-rise buildings in the suburb. If required, we can install a masthead or distribution amplifier to solve issues of a dropping signal. The type of amplifier we install will be dependant on your situation. It’s not recommended to just install any amplifier – you could do more harm than good. Wall mounted televisions look great in many homes. Not only do they help keep things looking clean and tidy, but you can hide away cords and cables from both eyesight and from little hands, as well as save space. As a homeowner, all you need to let us know is the location you want your television mounted and we’ll do the rest. 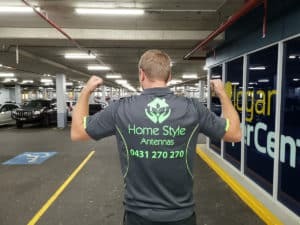 From checking for load-bearing issues through to resetting and getting your TV up and running, the team at Home Style Antennas has the experience needs to ensure you get a professional wall mounted system. With a licensed and qualified team, and offering same or next day service at a time convenient to you, Home Style Antennas can sort your television signal and offer antenna services in Runaway Bay.